The Overstrand Municipality and the Hermanus CPF have released the following information about the fires that have been raging in Hermanus, Betty's Bay and Franskraal in Gansbaai and farms in the region including the Hemel en Aarde Estate, Camp Hill and Bona Dea. Status: Partially contained with several high-risk areas that threaten neigbourhoods, farmlands and conservation areas. Crews will remain on the scene to ensure that the fire is completely extinguished. Multiple hotspots already reported and more aerial support on route. The evening brought welcome cloud cover to give the firefighters an opportunity to report their successes and losses. From the moment the first flare-up was reported Fire and support Services from all over the Western Cape, led by the Western Cape Disaster Management Centre, descended on the Overstrand. The communities of Overstrand have been severely tested. Both the #BettysBayFire and #FranskraalFire were ongoing incidents. Resources deployed include 2 Working on Fire choppers and a spotter plane. A gusting north-west wind drove the fire across Betty’s Bay and into the residential area on several fronts. 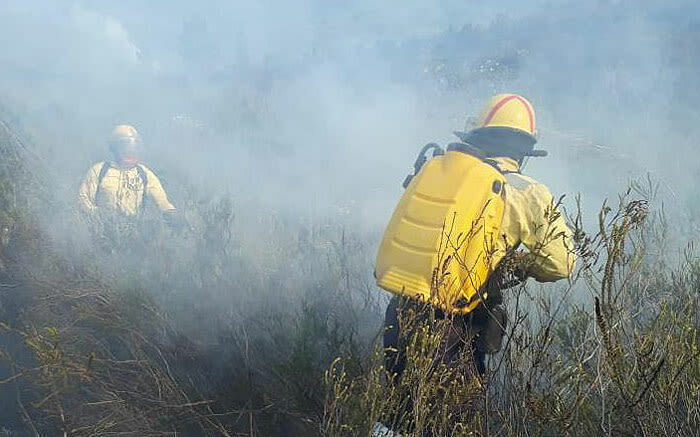 Two fires from the Karwyderskraal area were quickly pushed into the Hemel-en-Aarde valley, and over the mountain down towards Northcliff, Hermanus. The gale force wind prevented all aerial support options. A Joint Operation Centre (JOC) was established at the Hermanus Fire station from where the incidents are being managed. A power outage added to the challenge and the communication networks failed. Branch 1, Betty’s Bay, was commanded by Mr Willie Olivier with resources from City of Cape Fire Services & Bio diversity, Overstrand, CapeNature, Working on Fire, SANBI, Overberg District and Stellenbosch Municipality. Total staff number deployed is 102, and supported by several fire vehicles. Their focus was prevention of loss of lives and protecting structures. A 71-year-old male was seriously injured whilst evacuating his home, our thoughts are with him and his family during the difficult time. The fire reached homes on both sides of the R44. Preliminary Structural assessment reports 31 residential properties destroyed and 28 damaged. SAPS and law enforcement were also deployed in the neighbourhood last night. Current status and operations: Fire-fighting and mop-up operations in progress and will continue for several days. Still active fire lines and poses a risk for this area. Branch 2: Karwyderskraal was commanded by Mr Joe Schoeman, supported by the local and neighbouring farmers (goFPA FMUs & Rural Safety) and Overstrand Fire Services. Fire breaks did not stop the flames, fanned by the strong wind, and damages to structures, water pipelines, fences and other infrastructure including ESKOM pylons were reported. Current status: The Karwyderskraal fire continues burning, and there is still a risk of flare-ups. Ground crews were deployed early this morning. Active fire-fighting will continue on these fire lines, where there is still a risk for the area. Branch 3: Hermanus Heights (area from Onrusberg to Hermanus Fernkloof) commanded by Mr Anglo Aplon supported by Overstrand, Overberg and Cape Winelands Fire Services, Limitless Fire, Stem in Bos. Fire came across from Karwyderskraal crossing the Hemel-en-Aarde road and dropped into the mountain area above Hermanus, Northcliff and Hermanus Heights. A fierce battle ensued and proud firefighters reported no structures were lost in Hermanus Heights, the head was extinguished above Fernkloof. Current status: Creeping fire lines next to Madron farm (Vrede), Bon Adea farm towards the municipal farms. Last evening Angelo was supported by Overberg, Limitless and Cape Winelands. Today he is supported by again by Cape Winelands, Stellenbosch municipality, Garden Route District Municipality, Limitless Fire, NCC environmental services and a Working on Fire team. Active fighting and mop up will continue. Main risks is easterly spread into Fernkloof, old veld and westerly spread direction Glen Fruin (Chanteclaire). Branch 4: Franskraal commanded by Mr Brian Lobb. This fire spread from Masakhane over the R43, driven by the strong winds burned into the center of Franskraal. Aerial resources were deployed but stood down due to unsafe conditions and low cloud cover. Furious efforts to protect homes and evacuations ensured. This was and will be for a long time, a very difficult time for this community. A mammoth effort by Overstrand Municipality, Overberg District, Neighbourhood watch, local farmers and the local community limited damages to 2 structures damaged and 5 wooden structures destroyed. Full assessment still outstanding. Current status: It burned above the R43 into the mountains and has extended to high up in the mountain between Msakhane and Blue Horizon. Fire-fighting activities continued throughout the night. Fresh resources deployed early morning and aerial fire-fighting commenced. Joint commanders, Adel Supra-Vertue and Mr Lobb are supported by various role players including Overberg and Enviro Wildfire. 12 vehicles and 37 crews. Reports indicate that 31 residential properties have been completely destroyed due to the Overberg fires. The Overberg fire chief says three fire lines have flared up and an evacuation order has been issued for the Franskraal area.